Vacation rental cottage. 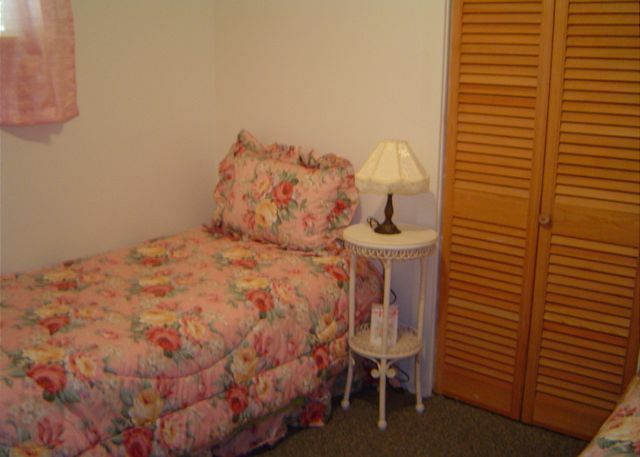 Sleeps 4, 2 bedrooms, 1 bathroom. Dogs allowed. This charming two bedroom, one bath cottage is perfect for a family of four. Enjoy all the lake activities, fishing, boating & swimming in the private sandy swim area. There is a fireplace for the chilly Maine evenings. 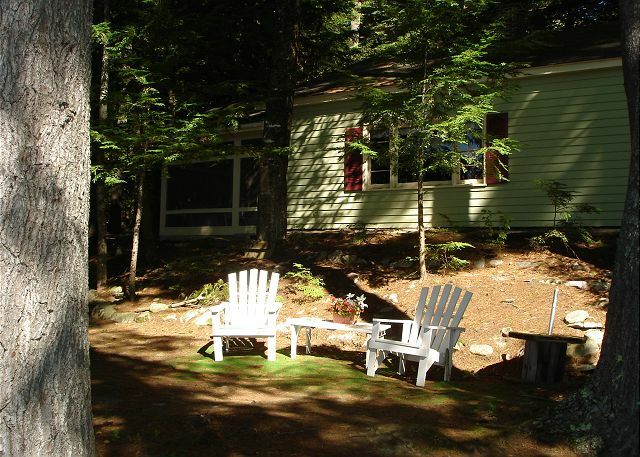 Sit on the large screen porch, listen to the loons & and enjoy a great view of LONG POND AND BLUEBERRY HILL. The quaint village of Belgrade Lakes is within walking distance. You can go for lunch, shopping & church. BELGRADE LAKES Golf Club is within one-half mile. Cottage was in great shape. Very comfortable. If your bringing in a boat I’d suggest launching first driveway is tough with a trailer but once in the water dock is a great place to relax. Lake was beautiful as was the area. Highly recommend this rental. Wonderful Camp. GREAT location. Screen porch really adds functional space. Walking distance to Town and easy access to Dock are a serious plus. We spent the first week in July at Sunset Cove and it was just delightful. The view of the lake from both the living room and from the screened porch was perfect. And swimming off the dock couldn't have been better. Access was easy and the bottom was firm. Just terrific. A wonderful relaxing week. The dock is close to the house and offers a wonderful view of the sunset each night. The screened in porch offers an outdoor place to enjoy the view without battling the bugs and the cabin is walking distance from the main street. We had a wonderful family vacation. Cabin was right on the water. Beautiful views. Great screened in porch for quiet nights, family gatherings, and dinners. The dock was great for our boat and for fishing off of. We would love to come back again! We have stayed at this cottage several times and love it. The views from the house are terrific, the dock is big enough to sit on comfortably and the screened in porch is a wonderful spot for meals. The cottage feels very private but is walking distance from town. We highly recommend it. Authentic Maine camp with lots of charm and character. Very quiet and peaceful, with beautiful views, yet easy walk into the village. Lovely memories and hope to be back. Had a great time in Belgrade Lakes. 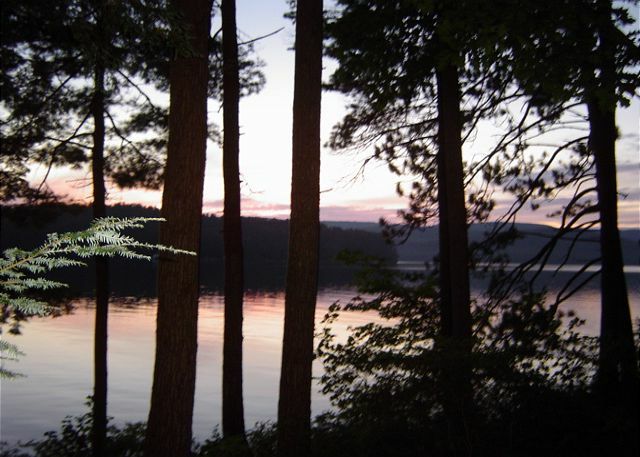 Sunset Cove cottage is on a beautiful location on the lake. We really enjoyed sitting on the dock during the day and also in the large screened porch for morning coffee and evenings to play games or settle into a good book. This was a great cabin with a nice walk into town. The kids (ages 6 and 2) loved swimming in the lake. Secluded and quiet at night. We've been going to Belgrade Lakes for a long time and this is a very nice place for a young family or couple looking to get away. Our visit started with a loan of towels from the rental agent. WE spent a restful, relaxed week and would like to return next summer! The view of the lake and sunsets were beautiful, the village and farmers market are all just a short walk away. There were a few things we didn't find that would've been nice (like grill tools, kitchen utensils and a first aid kit), but other than that, a delightful little cottage. This cottage is fantastic!! Right on the water. Large screened porch! Dock and outside deck! Secluded yet very close to town of Belgrade Lakes - a very quaint small town. i would recommend this to anyone looking for a great place to stay in Maine. Only downside is we had to rent a boat to use. Owners should consider offering a trolling boat or row boat to use during your stay. What a lovely spot to spend with family and friends! Loons, Great Blue Herons and lots of swimming provided our family with a needed restful vacation. We hope that this property will continue to be available for year to come! Wonderful week, weather was great. Enjoyed our stay, loved the little cottage, Will probably do it again next year. The Cottage was very quiet and relaxing. We loved the private dock and the screened in porch. It's ok to drink the water. Would definitely rent this cottage again. Great for a couple or a family of four. We had a wonderful week of relaxation!! Amazing sunsets and so peaceful! My favorite was the Loons singing us to sleep! Even the dog just slept all day on the dock!